Never underestimate the ability of Martinsville Speedway to inject a healthy dose of controversy into a championship battle. Sunday’s race left Martin Truex Jr. furious, vowing that Joey Logano would not win the title. Logano emerged from the race with a win, a new grandfather clock and a pass to the championship race at Homestead-Miami Speedway. He might also have a huge target on his back. Truex pursued Logano closely over the final 10 laps of the race. Again and again, Truex got to Logano’s back bumper, trying to find some way to get around the No. 22. They raced side-by-side for several laps until Logano surged back ahead. With two laps left, Truex finally passed Logano back. However, Logano was still close enough on the final lap to move the No. 78. To the surprise of no one, Logano moved Truex out of the way going into Turn 3. 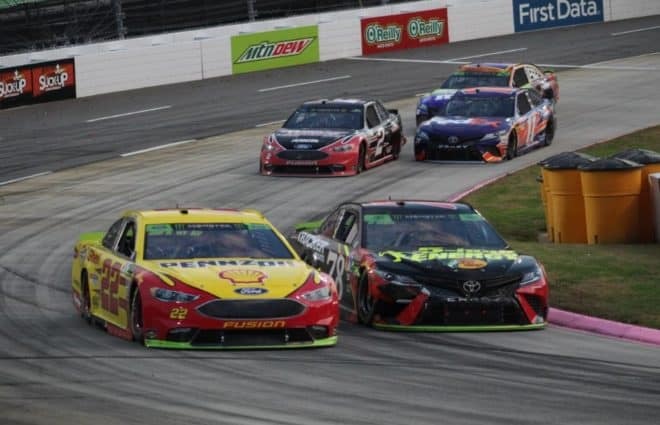 The two racers wound up side-by-side one more time, and Logano prevailed in a sliding, smoking finish that nearly saw both drivers wipe out on the way to the finish line. Indeed, nobody should have been surprised. But apparently Truex was, and he had a message for Logano after the race. “He won the battle, but he ain’t winning the damn war,” Truex said. “He ain’t. I’m just not gonna let him win it. I’m gonna win it. We should be in Victory Lane right now. But that’s just the way it went today, didn’t work out. Truex has a right to be upset, but it is worth wondering why he waited until the penultimate lap to complete a pass on Logano. The No. 78 was faster than the No. 22, and he had plenty of opportunities to move Logano out of the way. In fact, Brad Keselowski, Kyle Busch, and Denny Hamlin were closely following the two leaders during the closing laps. It was surprising how much restraint Truex showed with the race on the line. The most plausible explanation is that Truex knew the race was going to be close and was trying to race Logano cleanly, hoping Logano would do the same. Truex, however, should have known better. Logano has never approached the playoffs with a give and take mentality. Logano’s overarching strategy for the postseason is win by any means necessary and worry about the consequences later. That philosophy might not sit well with Truex, but that is always how Logano will react when race wins, especially ones with championship implications, are up for grabs. “Miami, just thinking about Miami,” Logano said after the race. “Thinking about how we can win a championship with this car. It was one heck of a race, and Logano’s pathway to Homestead is clear. But what happens if Truex also advances to Homestead? There is no way that he will show the same restraint towards the No. 22 that he showed at Martinsville. Truex getting eliminated from the playoffs might be even worse for Logano. If Truex goes to Homestead with nothing more to lose, he could easily prevent Logano from winning the championship. Nobody has forgotten Logano’s feud with Matt Kenseth in 2015. At Kansas Speedway in the second round of the playoffs, Logano made the decision to put the bumper to Kenseth in the closing laps of the race. The No. 22’s dump and run gave him an extra win and essentially put Kenseth out of title contention. So, Kenseth retaliated at Martinsville two weeks later by crashing Logano. Logano was angry about the incident at the time and had every right to be, but it never seemed to occur to him that he could have avoided the whole mess by not spinning Kenseth in the first place. In fairness to Logano, Sunday’s race was not the same as the Kansas incident. Logano never spun Truex out. He only hit him in the bumper enough to move him out of the groove and get alongside the No. 78. The difference between moving a driver, as opposed to dumping him, is huge in terms of hard versus dirty racing. In that regard, Logano might have learned something from the 2015 playoffs. That said, while Logano’s move was not dirty, it was also not equitable. Perhaps Truex should have raced Logano with more urgency. Perhaps he should have been more willing to move Logano out of the way. If Truex could go back and do the race over again, he probably would be more aggressive. But as the race was happening he made the choice to avoid contact with the No. 22 each time he attempted a pass. That might not have been the right choice, but that was what happened, and Logano responded with a bump and run on the first opportunity he got. High-contact short track racing is part of NASCAR’s grassroots history. But there is another important element of stock car racing that goes back just as far – I’ll race you how you race me. It is a basic rule of NASCAR’s self-policing style of competition. It is also a rule that has never meshed well with Logano’s “win now and worry later” approach, and one that he chose to violate at Martinsville. Sunday’s race could have finished without Logano and Truex making contact. Maybe Logano would have still won, maybe not. What we do know is that Logano did win, but by doing so he changed the nature of how he and Truex will race each other going forward. Specifically, Truex chose not to escalate the level of aggression with which he races Logano. Yet Logano made the choice to do exactly that, just like he did with Kenseth three years ago. And as everyone remembers, Logano did not win the championship in 2015. Going forward, Truex does not have to wreck Logano to follow through on his threat. But there are a lot of things Truex can do short of wrecking the No. 22 that will take Logano out of the championship hunt. And if Logano does lose the title at Truex’s hands, he will have to take responsibility for the way he raced the No. 78 at Martinsville. An aggressive move won Logano the battle, but if Truex follows through, Logano may lose the war once again. “Truex should have known better; “ what a sad commentary on Logano , what a pile of horseshit! Somehow I recall Truex using a gentle tap with his bumper to get past Logano several laps earlier. But that was OK and Joeys’ wasn’t? Dome on people! He didn’t wreck him like Hamlin di to Chase, he just moved him up. classic short track. Joey essentially knocked 3 SH R cars out of the championship race unless one of them can win a race. What would Tony or Harvick or Dale St have done that last lap of they were Joey. I think we all know without a doubt. That move was classic Martinsville short track racing. Joey did what he had to do and Truex has every right to be upset. That’s been NASCAR racing since the beginning. Truex’s biggest mistake was not making the move on Logano sooner. If he had bumped him out of the way a few laps sooner, Truex would have drove away with the superior car. You just can’t wait till turn 1 of the white flag lap when they can get you back in three. Anyway, that was another instant classic at Martinsville. Joey Logano did what he had to do at a place and in a race that all but requires some aggressive driving to win. He did what he was EXPECTED to do. Martin Truex left angry, but who wouldn’t be? He lost a race he had in the bag less than a lap from the finish. He’s certainly going to be pissed; it’s the heat of the moment. My guess is that by the drop of the green flag next weekend, Truex will be focused on the task at hand, not revenge. That said, if he finds himself being blocked by the #22, I suspect he’ll have no qualms about settling the score. That’s just racing. BRYAN, stop with the SAINT MARTY act. Look up a few years ago…2 I believe. I don’t recall the track. Here is what happened…Logano drove past Marty…Marty was racing the high line…Logano sped past him, Marty lost control…I don’t remember if that kept him out of the race. All I remember is Marty and his goon with no class crew chief and the roommate went on a TWITTER rant calling him everything, even thought it clearly showed Logano did not touch Marty, but that did not stop them from being whiny about Marty losing control over his car. Point is, Logano breaths and they will try and hit the right notes with the “haters” Marty was a master today, making himself the victim. Point is..Logano raced and raced as he should have..the personel bs people are trying to make of is hype with no truth. Just some background on Saint Marty, the victim. Is he part of the METOO movement? Kinda of sick of this, if it was anybody but a Penske driver…PFFT..great racing. And saying this caca about a short track is embarrassing. IMO. I hope Truex takes out the smiling jackass aon the last lap of the Miami race. Poetic Justice. What is equitable in a race? I love how this conversation always comes up ONLY when it is a Penske driver. The competitive drivers today and any other Martinsville race or short track employ the same tactics. Bump and run. Chrome horn..whatever you want to call it. Marty did it the whole race. It seems the media is chastising Logano for “going for it”. Again they all did it the whole race. Logano did what was done for decades and now because it is Logano he is the bad guy? Marty 18 laps lead. Logano 309 laps lead. Seems people lean towards the overtly whiney TOYS drivers with condolences, and focus on them, always. Marty had that lead for what 30 seconds at best, and it is the tragedy of the century because Logano gave him a little tap? While for years the ones whining would kick him around the track for sport and admit it. DALE JR. I am speaking of you! At least you admitted many years ago! Sick of the hypocrisy and double standards. Why is the revenge bs always for the whipping boys of the media, and the other drivers are always wronged by those dastardly Penske drivers? The narrative is astounding. Hypocrites. Well said, KB. The fan base has become so hypocritical: their favorite driver can move people all day long, but let him get moved once, and the calls for revenge commence. Unbelievable. This is exactly what people say they want to see more of….short track racing….beatin’ and bangin’….boogity, boogity, boogity bull sh*t. As has been stated, he didn’t take him out…it looked like a normal short track racing finish. But of course Truex is pissed…I would be. This conflict is the best thing to happen to the gate receipts at Texas since Kenseth took out Logano. There is finally some ‘water cooler conversation’ material. Fans have favorites…good…it helps sell T-Shirts. The only people that won more than Logano on Sunday was Nascar itself.